PEDIGREE® DentaStix® Fresh is designed to be chewed for long enough to be effective. Its gently abrasive texture, combined with active ingredients that work with your dog's saliva, helps reduce the build-up of plaque and tartar. The added Green Tea Extract and Eucalyptus Oil also freshen breath, but it's not just the dental benefits that you can feel good about. Dogs love to explore the world through their mouth, so it’s important to take care of their teeth. Plaque and tartar build up on teeth can be reduced by an effective dental care routine. PEDIGREE® DentaStix® Fresh has a unique X shape and, when fed daily, the combination of its special texture and active ingredients, is scientifically proven to help reduce tartar build-up by up to 80%. It also contains a unique active ingredient blend of Green Tea Extract and patented Eucalyptus Oil, when are proven to help freshen breath. PEDIGREE® DentaStix®Fresh - great tasting every day care. Letting your dog get on with what's really important - being a dog! 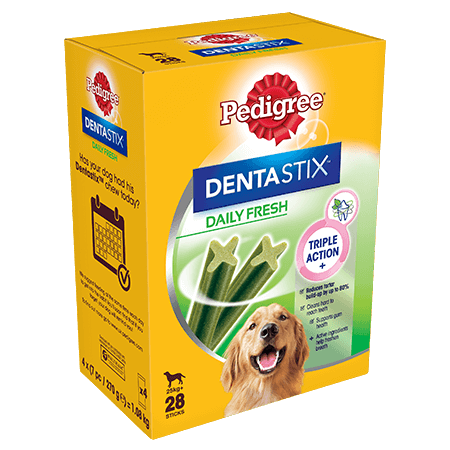 Pedigree Dentastix ® Fresh Large is rated 5.0 out of 5 by 3. Rated 5 out of 5 by Smith014 from These are his favourite. I've been buying this product for ages and my dog looks forward to having one on a daily basis because they're his favourite. Large dogs, e.g. Labrador, feed up to 1 stick per day. This is a chewy treat that is not suitable for dogs under 25 kg or for young puppies under 4 months. To maintain quality and freshness after opening, use the reseal device. Use within 14 days of opening. Fresh drinking water should always be available. Please consult your vet if your dog has persistent bad breath, as this is often a sigh of gum disease. We recommend a vet dental check every 6 months, together with an effective dental care routine, to help keep your dog's mouth in good health.